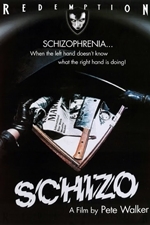 Schizo (1976) is a slasher film directed by Pete Walker and starring Lynne Frederick. When figure skater Samantha Gray (Lynne Frederick) married to England's businessman Alan Falconer (John Leyton), a sinister man from her past; William Haskin (Jack Watson) started stalking her, making Samantha depressed. Then the murders start.